View More In Electrical Tape. A budget-friendly choice for multiple purposes! Specification: This Copper foil tape is 5 mm in width, 25 m of the extended length. Made of copper material, it is electrical conductive and resistant from heat, moisture, chemical, corrosion, oxidization and discoloration. Wide Capability: Avoid unwanted interference on your electronic devices, perfect for paper circuits, electrical repairs, EMI shielding, soldering. With shining color, it's also cool to be used in DIY crafts or home decorations. Works on Your Garden: It really does work for slugs and snails! Sounds Strange? Use the tape as a pest deterrent, and you will witness amazing changes in your garden. Strong Thickness: This Conductive tape has a good adhesiveness for better usage experience. Easy to cut and can be cut out to any length or shape as you like. 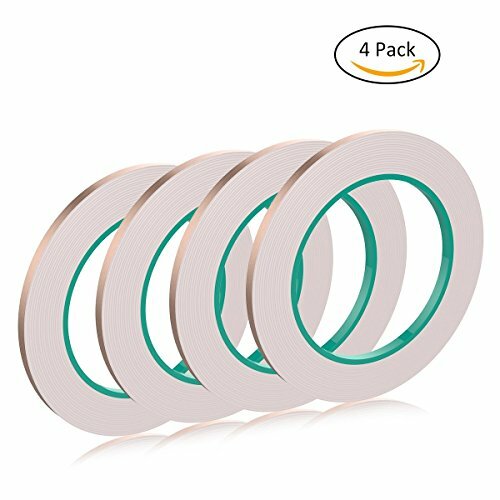 Sufficient Quantity: 4 rolls of Copper foil tapes are included in the tape, providing you a budget-friendly choice for multiple purposes.